I’m releasing version 1.5.7 of my WordPress Theme Patagonia. In the last few versions of Patagonia, I added some great Theme Options and improved the CSS Style Sheet code. With the new Theme Options, you can set your custom RSS Feed and your Twitter link, directly from the WordPress Dashboard. As always, Patagonia Theme is fully compatible with the latest version of WordPress (Version 2.8.4). I also made sure that the latest version of Patagonia is 100% Valid to CSS level 2.1 and XHTML 1.0 Transitional. Remember, you can find these Theme Options in Appearance -> Patagonia Options. 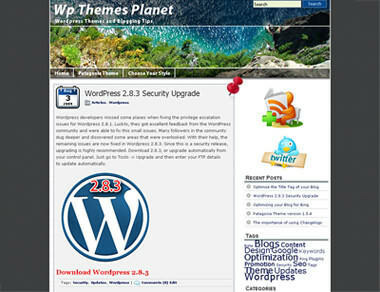 Subscribe to the RSS Feed to get updates and follow WpThemesPlanet.com on Twitter. Thank you for creating this nice WordPress Theme and giving support for it! Thank you so much for your donation and support. 🙂 It’s really appreciated! Please don’t hesitate to contact me if you need to customize or change anything else. Hey, I like it a lot–but I want to change the pictures in my post. I don’t want them on the side, I want them on top of the text. What did I do wrong? Where do you fix it? Any way I can change the thumbtacks to a little red truck. You’ll see when you visit my site. Hello there, can you send me the url so I can see what is causing your pics to display on the side? Hello Jeffrey, I visited your site and I can’t find any error. Can you please send me the url where you have that problem? I’m new to this and I need to know how to change the default headings that are on the sidebar to something like you have here. You can do that by moving the correct widgets onto the page that you want. You can also customize the widgets as well. Hi Nick, contacting you to help you resolve this.